Bunnies Need a Lifetime of Love and Attention! Things That Bad Bunnies Should Have to Write on the Chalkboard 100 Times! Do not reply or buy from mary Shakespeare or Benson for a squirrel it is a scam! The Mini Lop Rabbit has adorable droopy ears, making it look sweet and even a bit comical! Besides being so very cute, the Mini Lop Rabbit is a favorite bunny because they are so sweet and cuddly. These rabbits will stay smaller than a regular rabbit and they make a great pet for children. The Mini Lop Rabbit is lively and smart. Not only are they very "huggable" and playful, they are known to be successfully litter-box trained. They make great companions that like to interact and appreciate affection, and are often described as being like a pet dog. Both the Mini Lop and the Holland Lop are miniaturized versions of the Lop-earred Rabbit. Background: Mini Lops were derived from German lops called "Kleine Widder" lops, but it is thought that a variety of breeds have been used in developing the Mini Lop that is found in the United States today. Mini Lops were recognized as their own accepted breed in the United States in 1982, but neither they nor the Holland Lop are yet recognized in England. Description: Besides having the characteristic floppy ears, Mini Lops have a muscular build with broad shoulders, deep chests, and short, thick legs. Their adult size is generally only about 5 1/2 to 6 1/2 pounds. Color differences: Mini Lop rabbits come in all colors. For showing, the American Rabbit Breeders Association, Inc. (ARBA) and the Mini Lop Rabbit Club of America have recognized colors and guidelines. Agouti: includes chinchilla, chestnut agouti, and opal. Broken: which are white with colored spots and /or pattern, including tri colors. Ticked: these have a steel gene and ticking, colors include: gold tipped or silver tipped black/blue/chocolate/lilac steel, silver fox, sable or smoke pearl steel. Self group, white pointed: these are a solid color with no ticking and include includes: black, chocolate, blue, ruby eyed white, lilac, etc. Shaded: these show shaded markings with colors such as: seal, sable point, sable, smoke or frosted pearl, tortoise, etc. Wide band: includes cream, red, orange, and fawn. There are also many colors that are not recognized (though some are in the process of becoming recognized) including: harlequin, otter, silver marten, blue seal, broken pointed white, chocolate or blue point, etc. Im thinking of getting a mini lop eared bunny in Augest, 2015. If there is anyone who knows where I can find a rabbit breeder near in hinesville, ga, could you please tell me. I got two mini lops, they are 4 1/2 months old and are very skittish. They hate being held and don't want anything to do with us. They get along and play with our dog, but want nothing to do with humans. Is this normal behavior? How do I get them to come around we have had them for a month now. well Devin this is not very common but my rabbit Lilly was like that until I started spending lots of time with them maybe they will like that forever but spend more time with them and treat them while you pet them and such I really hope this works for you!! Once it gets used to you, hopefully it will be fine. But this should be totally normal. My rabbit was like this, also. Let the rabbit come to you. most bunnies once mature dont really care for being held or carried for long periods of time they rather have their feet on the floor, but if you are patient you should eventually be able to pet them and get them to trust you, i had a mini lop a few years ago that hated being touched thats just how she was, my mini lop now is litterally not afraid of anything and doesnt mind being pet, he doesnt like being carried or held though. I have two one and a half years old mini lops. Their names are Bramble and Crunch. Crunch is ginger with a white belly and Bramble is black, ginger and white. They both have dark brown eyes and they have had lots of offspring. Now I am a rabbit breeder. 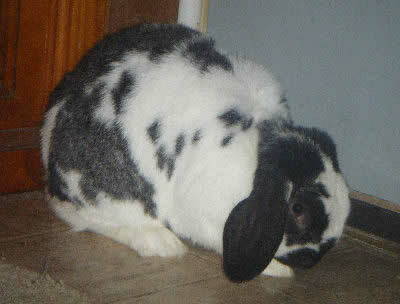 The tamest rabbit is black and white, she's called Flopsy and she has two lopped ears. ADORABLE! !